Rest Day in Namche, Lukla Bound Tomorrow! So everyone is now in Namche Bazaar resting after the last few hectic days. It is good to be down low where the air is thick! The summit day itself was a long day for all, with Chris going all the way back to base camp after the early summit due to the cold. Whilst Henrik, Pemba and Mama made good time and arrived in camp 2 in the day light, Sam and I took a little longer and ended up descending the Grey Tower in the dark. We were only to hear of the horrors that other teams had suffered the next day. Some teams had suffered from the cold and the wind and ended up with frostbitten fingers and toes, whilst another had badly hurt his ankle after he took a fall high on the hill. 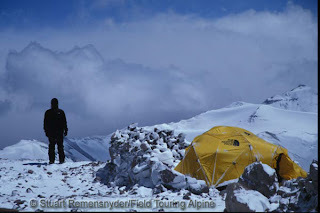 For those of us that slept at camp 2 the following day promised a long descent with many teams moving off the mountain. the Yellow Tower proved to be as exhausting going down as it was going up but the views seemed that little bit better. Camp 1 could be seen as we traversed towards it with the boulder field dropping away below. Mama and Pemba pushed on to strike camp 1 and then descend in rapid fashion. Slowly behind, and by now already tired, we followed. Our bags were now a little heavier although Sam seemed to have taken everything with him on the mountain including the kitchen sink and so had a huge pack towering over his head. Our descent was slow due to this and our fatigue, but the weather was kind and we tottered into camp in the early afternoon. Ratna served up a feast for dinner including a summit celebration chocolate cream cake that was shared between all the team and the staff. In a sugar-high and exhaustion induced haze everyone retired to their tents to collapse comatose for a well-earned sleep. The decision had been made to break base camp and head for Namche, a walk that would normally take 5 hours, passing through Pangboche, Debuche, Thengboche and finally up a long hill into Namche itself. Chris and Henrik blasted off with myself Sam and Mike bumbling along together at the back. In all it took about 6-7 hours for us all to reach Namche but the reward was a yak sizzler on Chris, very tasty after a long day. As we had neared Namche we were treated to final views of the incredible Ama Dablam summit where only days ago we had stood. Ama Dablam's upper slopes, which were once unfamiliar and awe-inspiring terrain, are a vertical world we now know intimately and respect deeply. Then all of a sudden we rounded a corner and stark and snowy vista gave way to green slopes and houses and then the bustling enclave of Namche. Now we are all recovering on a rest day as the shaggy yaks catch up and head to Lukla. Chris is indulging in a combination of beer and 18 hours of sleep, whilst everyone else is trying to rehydrate properly and catch up on deprived energy stocks - Sam's diet of Gummy bears and pizza seems to be helping him! Tomorrow we head down the valley to Lukla to catch our flights to Kathmandu on the 26th. It will be great to amble along the Dudh Khosi river, stop for hot lemons at the myriad of tea houses we pass by. All the while we'll day dream of soft beds and hot showers in the hotel and celebration meals in the Rum Doodle and Everest Steak House restaurants! When we get back to town and upload speeds are better we'll post some of our best images from the trip so check back in a few days for more! Chris called in today to let us know that everyone is back in BC safe and sound. Apparently it was extremely cold on the summit day and it was a big effort on everyone's part to stay warm enough. In the audio dispatch below you can hear more details about summit timing and the return to BC. You can also hear in Chris's voice that this kind of cold high climbing takes a toll on the vocal cords! Chris and the entire team and BC staff are breaking camp tomorrow and will go down to Namche for two nights of R&R, pool matches, celebration Yak Sizzlers and now that they are on the way down likely quite a few beers! There are several excellent poolhalls in Namche and often teams on the hill will enjoy a friendly but well contested match complemented with a musical backdrop of Pearl Jam or Bob Marley! We'll look forward to more dispatches from Namche and Kathamndu along with some pics from the trip! I received a call from our ground staff in Kathmandu that our team had summited at 10:30am from camp 2 and were on their way back to C2. We expect to have word of their safe return to C1 or BC, as well as additional information about the summit bid itself, in the next 24 hours. Summiting were Chris, Ian, Henrik, Sam, Pemba and Mama with Mike having aborted the push and returned to C1. From talking to Chris before the push I know that there were several teams making a summit bid at the same time and he was concerned about logjams so it is possible that the descent may be slow as they take care to move in the Grey Tower. As they have already topped out and are on the way down the plan is for them to now fly on 26th from Lukla and be back in Kathmandu with some time to enjoy the city and sights. The extra rest time is good news or Chris who is of to Aconcagua in early December for 2 trips. Still spaces available for Dec 12 and Jan 9 departure dates! We'll have more detailed report shortly and get that up! Ian called in yesterday from Island Peak BC to let us know that he, Mike, Henrik, Mama & Pemba all topped out on Island Peak and were safely down. He then sent in a great note today from Dingboche with more details. Sounds like they had a great climb, got of early and beat the main crowds to have the summit largely to themselves for an early sunrise in strong winds. The advantage in being a small and fast moving team was that they were able to top out and descend before running into the crowds and getting stuck at any logjams. They are on to Ama Dablam BC today to meet up with Chris and Sam. After a few rest days they will then begin the second wave of summit bids for us this season. Our first group including Ama Dablam & Island Peak summiteers and Everest BC trekkers are all safely out to Kathmandu and most already on their way home. We congratulate them all for a great trip and look forward to having them aboard again. We should be hearing more from Chris and his crew from BC in the next 24-48 hours with the plan. At this time they are a bit ahead of schedule and are planning to return to Kathmandu on the 29th Nov if the weather continues to cooperate. Chris called in from BC along with the summit team to let us know everyone is down safe and sound! You can listen to his audio dispatch below. Emilia and Eric will now enjoy some days ambling in the Khumbu before heading out to Kathmandu and on to home. We have enjoyed having them with us this season very much! It is always a great thing to finally arrive back at an FTA nepal basecamp for a summit cake by Ratna! Ian has also called in from Namche to say that the trekking group was on its way to Lukla to meet our agent Nima and head back to Kathmandu today. Meanwhile our November Island Peak/Ama Dablam group is already into Namche with Sam and Ian and they will meet up with Chris in Pangboche in a few days. rom there they will head back up to Ama Dablam BC to rest for a few days before the climbing begins all over again! Our group left at 2am and at 9:30am 4 of our team stood on the top of Ama Dablam and took in the grand view from the top over to Everest, Lhotse, Nupste, Makalu and a look down on the Chukhung and Island Peak down below! They enjoyed them selves on the summit and then descended to C2 arriving at 4:14pm for a total of 14 hours 14 minutes round trip! Chris plans to head up to C1 to help them come down in the morning and in the mean time Sam has headed down to meet up with the incoming November group. The incoming November group has already flown to Lukla and they are enjoying a first evening at high altitude near Phakding. They will arrive in Namche tomorrow and be greeted by Sam and Ian. Our trekkers Hong and Christine will fly out from Lukla on the 7th and enjoy a side trip to Pokhara before flying home a week later. Oscar continues to amble about the Khumbu and will be meeting up with Eric before they fly out on the 10th. Our trekking guide Tsering is accompanying Christine and Hong our to Lukla and then will be joining the November team for the trek in and for the Island Peak climb. Our November team was to include FTA alum Brad Jackson and his wife Sandy Hoby but she suffered a most unfortunate injury just 48hours before she was to leave Sydney. While out on a rainy day she took a mistep and fractured a bone in her foot and was given 6 weeks to heal up forcing her to give up her trip. We look forward to having Sandy and Brad aboard again soon and expect they may even join us for Ecuador in January or Tharpu Chuli in March! The remaining November team members Mike Herbert and Henrik Olsen will join Chris, Sam, Ian, Pemba, Mama and BC staff Ratna and Sonam for the second round of Island Peak and Ama Dablam so stay tuned for more adventures ahead! Chris called in a disptach about the summit group and you can listen in below! Ama Dablam Oct Summit push is On! Chris called in to say that the 4 members ( Emilia, Pemba, Eric & Mama) are in C2 planning to make a summit bid starting at 2am on the morning of the 4th. Chris and Sam are both in BC at this time - Chris nursing a bruised rib from the yellow tower and Sam suffering a bout of khumbu cough. We expect both to be back in action shortly! Stay tuned for a summit bid update! Chris called in from Ama Dablam BC to let us know that our Ama Dablam team is now all in basecamp including Chris, Sam, Erik, Emilia, Mama, Pemba & Ratna (our infamous cook!). After some rest days they will begin a summit push and we should have an update before they begin the climb in earnest. Ian, Hong, Christine, Oscar and Tsering have all headed off for a trek to Gokyo and we look forward to hearing from them along the way! The word is lots of summits already and a route in good shape so as Chris will say: "game on!" Chris also left an audio dispatch and you can listen in below! Summits on Island Peak (Imja Tse) 6186m and everyone down safe and sound! Eric was not feeling super strong leaving from high camp and decided to abort the summit push and save his energy for Ama Dablam. We applaud his wise choice and it bodes well for a safe climb on Ama Dablam! He returned to rest up at high camp accompanied by Mama (Siddhi) who then turned about and caught the summit group and joined them to the top! Mama continues to prove an incredibly strong and fast climber and an up and coming sherpa guide. I have known Mama for 4 years it has been great to watch his growth as a guide. He began as a cook assistant & high altitude porter and has been working on his climbing skills every year. He has now guided on Island Peak for a third time with FTA and worked on our Ama Dablam and Cho Oyu trips as well last year. Looking forward to seeing him join our Ama Dablam team for his first summit bid in support of Chris and Pemba. They will enjoy an easy amble down to Dingboche tomorrow likely stopping for cups of hot lemon at the tea houses in Chukhung and an evening of hot soups and popcorn in Dingboche. The trail back to Chukhung is pretty uneven but from there on down it is a gently descending trail with outrageous views of the massive Nuptse/Lhotse wall. Anyone who has seen the wall up close from Island Peak or Chukung Ri has seen one of the largest reliefs imaginable. Rising more than 7000ft and less than a mile away it is hard to take in all at once! Tsering, Ian, Oscar, Hong and Christine will join the team back to Dingboche tomorrow and then head off for the Everest BC trek. We'll expect to hear from them every 3-4 days as they make their way to Lobuche, Kala Pattar and then over the Cho la to Gokyo. It is one of the great treks on the planet and we look forward to hearing how much they enjoyed themselves! Chris, Sam, Erik, and Mama will climb back up to Ama Dablam BC to join Pemba and Emilia and begin the Ama Dablam climb after a few days rest. If all goes well we expect them to be making a summit bid on or about the 5th of October. An exciting start to the FTA autumn season in nepal with lots of action still to come! Team on the move to Island Peak! Chris dropped a quick note from Dingboche to let us know that the entire team on the move to Island Peak! He reported that everyone was feeling very well with the altitude and that tummies were all settling down - good news indeed! Ama Dablam 2009 reaches BC! Chris called this morning to let us know that the team had all reached Ama Dablam BC on the 21st! Despite a few GI gurgles the team seems to be doing well and looking forward to a rest day in BC today before making their way to Island Peak. The weather is apparently great, the route is already in to C3 at this point and everyone's spirits are very high! At this time our team at BC consists of Chris, Ian, Sam, Eric, Oscar, Christine, Hong, Tsering, Lhakpa, Pemba, Siddhi and Ratna. Emilia will be arriving shortly after trekking about the Khumbu for a few weeks on her own and in time for the Ama Dablam climb itself. Our November group of Brad, Sandy, Mike and Henrik is nearly set with room for a few more so let us know! They will be flying up to Lukla on the 3rd and hopefully crisscrossing with our October team at BC for a big summit party!! Chris has left an audio dispatch from BC - enjoy hearing his voice from high in the Khumbu Valley! Listen to all the Field Touring Alpine Audio Dispatches at Gabcast! Ama Dablam 2009 all set to begin. The boulderers are coming. Chris and I have met up in Kathmandu after our various adventures leading up to the start of the Ama Dablam Climb and Everest Base Camp Trek. The last few days have been spent meeting up with the Godfather of Nepal Nima Sherpa, who seems to be able to rectify all the problems that Chris and I create with a smile and a nod of his head. Due to equipment loss on Satopanth Chris had to replace a number of ice screws, so after buying all the remaining Black Diamond ice screws in Kathmandu during a bought of retail therapy he presented Nima with a substantial bill. Without batting an eyelid Nima said he could pay that now. Chris asked if his bag was full of money to which the reply was "yes please" and a brick of 1000Rp notes was produced!! Bill settled! FTA guide Ian Blessley leading a nice slimey pitch in the Nangajon Forest"
Thamel has changed significantly since I was here 10 years ago. They have recently tarmacked the roads in Thamel, power cuts only last for about 4 hours an evening, and everyone now has a motorbike. The rickshaws, tigerbalm and hasish sellers are still the same and may even be the same people! The constant barrage of people trying to sell you things rapidly becomes a game of avoidance, coupled with the wry smiles as they catch you, recognise you and know that they are not going to get a sale! Pollution is still a major problem and a sore throat and sore eyes encouraged Chris and I plus a few others to head out to Nargajon, just below the Kings Palace for a few days of climbing. After the inevitable haggling and readjustment of prices with the taxi driver we made it to a very pleasant looking limestone crag tucked away in a shady glade in the Kings National Park. On the first visit we concentrated on a few simple climbs at a slabby wall that was a little dirty but provided some good fun, until the mosquitos turned up and a hasty retreat was required. Armed with mosquito coils we returned a few days later to attempt some of the harder routes. These were slightly more technical and a little wetter and dirtier but with much sweating and cursing the anchors were reached. During the afternoon a number of gun shots could be heard leading us to the conclusion that the King was in residence taking pot shots at the locals, or perhaps the odd tiger or two that we were assured were in the park. A little later automatic gunfire and large explosions were heard, perhaps the King is a poor shot!! Ian in the chimney run out and gnarly! Yesterday we met up with Oscar and Eric and helped them organise early flights to Lukla (well Nima did) for some acclimatisation. We are expecting more people to arrive every day and look forward to leaving the smog bound capital for the fresh air and beautiful views that we know await us in the Solu Khumbu. Bouldering in the Everest Region? Last year, Josh Kass and i were able to spend some time in and around Namche Bazzar putting up the odd bouldering problem. A vast field of large boulders skirts the town and i remember being awe struck by the quantity and quality of the bouldering up there. There is virtually unlimited development potential and at the time, we thought a bouldering trek to the area would be a really great thing. Well, its happened. This morning, Rachell (Canada), Brian (USA) and Kyle(USA) all blasted off for Lukla with plans of spending a month up in Namche putting up problems, making maps and generally developing a new bouldering area in the Khumbu. If all goes well, next season we will be offering something very unique indeed. Climbing small rocks beside the biggest rock of them all! Everest. Some might think it folly, but ask any boulder and its a dream. Lets wish them all luck and stay tuned for some photos, maps and beta in the weeks to come. FTA Ama Dablam 2009 under way! Guide Chris Szymiec is now in Kathmandu making early preparations for our trip and much of our gear, rope and food is already staged in Pangboche! Chris will be out rockclimbing for a few days and be back in town to meet our first members arriving on the 11th. One member, Emilia, who will be joining us on the 22nd Oct in Pangboche, is already in Namche on a trek to Gokyo, over the Cho La and around to Island Peak! Assistant guide Ian Blessley is off trekking in the Langtang and will meet up with Chris in KTM by the 13th fit and acclimatized! We have room for a few more on each trip (Oct 15 start and Nov 4 starts) and as well have room for Island Peak climbers and Everest BC trekkers on these same trips. Visit the FTA home page for links to all our trips! 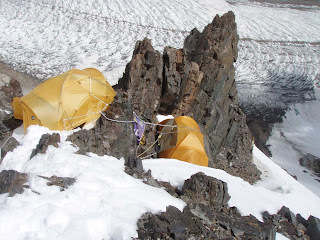 Chris has managed to upload a great number of images from the 2009 Satopanth trip including summit shots and images sure to entice the alpinist in each of us. When Chris has a chance in the week ahead he will be writing up a nice trip report and post that with details from the trek in and more about the summit day and the earthquake moment! In speaking with Chris quite a bit over the last 2 days it is clear that Satopanth is fantastic climb for our members and so we are fully on for a return climb next autumn! Chris could not be more complementary about the great job of the HAP's Raj, Raj and Thapa and we expect that their return visit will be another great trip. Let us know if you'd like to join Chris and the Raj's! I have put in a few of Chris's pics below and to see all of them you can visit the Satopanth Gallery. 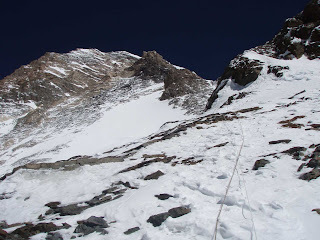 Chris has left an audio dispatch about the summit day and the plan to return to Delhi and in it has described an earthquake that took place on their summit day during the descnet. Chris describes the entire summit ridge shaking and serac cleaving off from the summit while traversing the steep ice face! We have confirmed that there was indeed a 6.1 magnitude earthquake on that very day in Bhutan and a 4.8 magnitude aftershock was felt in Uttaranchal where Satopanth lies. In researching the epicenter and BC locations is seems that our team was climbing less than 40km from the epicenter, which explains the very exciting time they had on the mountain and that they must have really been experiencing the full import of the quake the way a mountain of jello would if you bump into the table! google earth image - E is the epicenter and B is base camp! i am sure the members will have more to say when they return! The US Geological Survey reports that the Bhutan earthquake took place in with an epicenter around 125 kilometers north of Gauhati and 180 kilometers east of Bhutan’s capital, Thimphu. Apparently the earthquake shook Bhutan and India’s northeastern Assam state. As well the quake was felt as far as Bangladesh and Lhasa, Tibet. It will be interesting to see if any of the teams on Cho Oyu or Shishapangma felt anything! They will be heading out in the morning and should be in Gangotri on the 25th. more news and loads of images still to come! Chris called in from BC a few minutes ago to let us know that our entire team is back down safe and sound to BC and will be enjoying a much needed rest and cleanup day tomorrow! The weather continues to be fantastic and another team has even shown up to begin their climb so the season looks to be quite long this year. Tomorrow they will rest and dry all of their gear out, take showers, eat and sleep and take great pleasure in looking back up at the mountain and knowing that they have visited its slopes and played in rare air and know the mountain like few ever will. The following day they will begrudgingly take their leave of this sanctuary of time and place and begin the 2-day walk out to Gangotri by way of Bhujbasa. If all goes according to plan then the team should be out to Gangotri on the 24th and will meet up with Tom there and continue on back to Delhi though having completed the climb so quickly there may be interest in enjoying Gangotri for a few extra days! Chris will be enjoying the down time after this climb and getting ready for the start of Ama Dablam on the 15th of October. We still have room on both the Oct 15 and Nov 4 starts for Ama Dablam as well as a host of great climbs in the year ahead including peaks like Aconcagua and Ecuador Volcanoes in the Dec to Feb slot and then Kilimajaro with Sean James in Feb-March and then back to Nepal for Tharpu Chuli, Cho Oyu, Makalu, Baruntse and Island Peak....something for every level of climber! Nearly all of these trips have a trekking component so let us know if your family and friends want to come along too! see our site for all the trip info or drop us a note at "info@fieldtouring.com"
Chris called in this morning from the summit of 7075m Satopanth along with co summiteers Italo and our haps Raj and Raj! They sounded very excited to be on the top and were feeling great! Chirs said the views were amazing and the weather could not have been better. They took about 5 hours from the high camp and arrived around 9:45am. Veronika began the morning on the summit push but was feeling too cold and returned to the C3 to await the team's return. She must be disappointed but she has made it through all of the most technical climbing on a very demanding peak and must be very satisfied nonetheless. They plan to descend to C2 today and then all the way back to BC tomorrow for a celebration. Chris plans to call in later when they are back down and we'll check in then to let everyone know they have made it back safely to BC. Enjoy Chris's audio dispatch below from the top of the Garhwal Himalaya! Sept 20 - team in satopanth c3 - summit tonight! Chris called in this morning to share the great news that the team is in C3 at 6443m and ready to head for the top at 4:00am. Chris, Italo, Veronika, Raj and Raj are all ensconced in their Marmot tents (Alpinist and Thor 2's - thanks Marmot!!) and getting a little rest food and water before roping up for the climb. An Indian Army team was able to summit today so the route is clearly in for the team and bodes well for them. As well the weather has been stable and spectacular so all the signs point in the right direction for the team and we hope to hear from them on the summit in short order!! Chris has also called in an audio dispatch with color commentary on the climb and he will call in from the teams high point which we hope will be the top! click on the player below or a listen in! more news as we have it!! Satopanth C3 established - summit bid on for tomorrow night! I had a nice talk with Chris earlier today and he has also posted an audio blog that you can listen to below. He says that all is well and that the route is now in to C3! They plan to move up tomorrow to C3 early in the day and then begin their summit bid that night. Chris says that the climbing is incredible..steep and exposed and outstanding. Can't wait to see the pics! Anyone on our trips to Ama Dablam and Aconcagua this year will get a chance to hear first hand from Chris about the climb! Sounds like a great trip to consider if you are thinking about Ama Dablam or Aconcagua Polish or have done them already. We have also had a nice call from Tom who is much improved and enjoying his time in Gangotri and now plans to do a few days of trekking about before meeting up with the team on their way out. More news as we have it and the summit bid is truly underway tomorrow! Stay tuned!! Chris calls in form C2 to say that the route is now in to C3 and tomorrow the team will move up to C3 and make a summit bid that night! Chris says that the climbing has been very steep and sustained and in his words "full on"! We have just a few weeks until we close our positions for Ama Dablam Oct 15 and Nov 4 Start and still have room for climbers and trekkers to join us! We are confirmed for island Peak, Ama Dablam and the Everest BC trek for both date and welcome you to join us! Our Dec 12 and Jan 10 Aconcagua trips with Chris Szymiec and our Jan 5 Ecuador Volcanoes expedition are also confirmed with room remaining for a few more! The most exciting news is that we have confirmed the addition of Makalu in May/April and Nanga Parbat in June/July with Fabrizio Zangrilli leading both trips! In addition Chris will be leading Cho Oyu and Sean will be leading a Baruntse/Mera trip and Ben Kane will be off to the Annapurna Circuit with Thapru Chuli. Short trip and long trips, low hills and high mountains, moderate slopes and steep faces....we have something for everyone in the year aheaD. Nearly all of our climbs have trekking components so bring along friends and family! contact us at info@fieldtouring.com for information on any and all aspects of our program! Sept 17 - Satopanth C2 reached! Chris called in a short while ago to let us know that the team has reached C2 and will be spending the night there at 5965m. At this time the summit team will be Chris, Italo,Veronika and Raj with the remaining 2 HAP'S (Raj #2 and Thapa) carrying loads to support the push and then planning to meet the team as they descend on summit day. 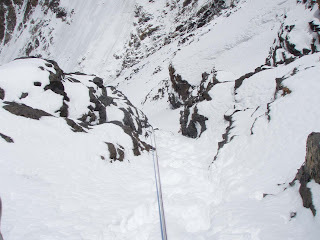 Today they had an awesome day of climbing in deep snow and a combination of fixed lines, roped and unroped climbing. They are on the same schedule as an Indian Army team and apparently have a great time together! Tomorrow they plan to fix the route to C3 along a knife edge ridge of steep snow and ice and then move up the following day. After a rest day on the 20th when they will prepare the lower part of the summit portion they will go for it on the 21st. The weather has been "bluebird" skies according to chris and the reports are for good weather well through the summit push - keep the fingers crossed! Chris has stated several times that he thinks this is the most beautiful mountain he has climbed on and that this is his favorite climb ever! These are words that carry a lot of weight as Chris has climbed on Spantik. Ama Dablam, G2, K2, Broad Peak, Tharpu Chuli, Aconcagua and much more!! He is already excited to return to Satopanth next September so if you missed out this year and want to join Chris next year let us know! Chris will post and audio dispatch tomorrow with the very latest! many of you may have noticed our site has been on the fritz the last few days. please don't despair! we have replaced it with a mini version for the moment and we are working round the clock to undo some damage done by robotic hackers. This is apparently very common with sites using wordpress so we hope to have it all sorted out shortly! 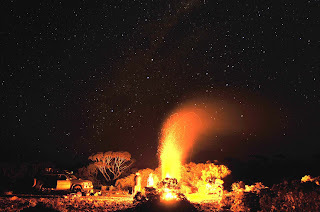 Sept 15 - Satopanth Expedition Summit Bid under way! Chris calls in from C1 to report all is well! The team plans to make a carry to C2 at 5900m tomorrow and then continue on up the next day with hopes for a summit bid on the 21st! 14 September - Satopanth C1 established! Chris has called in to let me know that all is well and the team has established C1! Yesterday Chris, Italo, Veronika and our two HAP's Raj and Thapa made a load carry to C1 and established the camp at approximately 5400m. After a rest day today they plan to move up to C1 tomorrow. They are planning for a first summit bid on the 21st of September if all goes well and the weather holds. After many days of snow they are having perfect days now and the reports are for at least 4-5 days of good weather ahead. we will revisit the weather each day and hope it holds! Tom has unfortunately not been feeling well and fighting a GI battle for a week and as such had determined he is not strong enough to make a safe attempt and went back down to Bhujbasi yesterday and reached Gangotri today. Tom called in a short while ago to let me know all was well and that he plans to rest up, enjoy some days in Gangotri and then head off on a few great treks until the team comes out. It is always hard to decide when enough is enough and it sounds like Tom has made a very wise choice. We'll hope he has a great adventure trekking and look for him to have a more healthy time from here on in. Chris has also left a new audio dispatch and he goes into some detail about the teams movement as well as the story of the evacuation of a group of stranded trekkers who were trapped by the heavy snow snowfall over the last week! He said that they were plucked off the hill by some great flying by the indian army. Chris was not sure what kind of choppers they are and they may be the following. Chris calls in from BC with an update on the climb. Three members (chris, Veronika and Italo) and 2 HAPs (Raj and Thapa) have established C1 already! One member (Tom) was not feeling great and has gone down back to Gangotri to recuperate and will do some trekking til the rest of the team comes down. Chris says the mountain and route are stunning and we'll look forward to a great slide show on the site when the expedition is concluded! Sept 11 - Satopanth BC reached! Chris call in a little while ago to let us know that the members and HAP's had reached BC at 4700m and that they are all doing well but not without a bit of an epic day. Snow has fallen quite hard for the last day and they arrived at BC with nearly a meter of snow on the ground. Just two days ago arriving teams were setting up on grass and hopefully the snow will melt in short order! The challenging conditions made it impossible for the porters to safely travel and they stopped about an hour short the BC. To travel from where they stopped to BC requires a glacier crossing and cliff traverse and with a meter of snow hidden crevasses and slips on steep slopes had become a real concern. Tomorrow Chris and the HAPs will go back and begin the process of ferrying up the remaining supplies up to BC. The staff and porters are still back a few hours the team was kindly taken care of by an Indian Army group and we thank them for their generosity and hospitality. The reports are for more snow in the next day or so and then clearing so we hope that the team will be able to make some progress in a few days. Clearly they will need to let the snow settle before getting onto the slopes! The slowed pace of arrival has had a very positive impact on the teams acclimatizing and they are all feeling excellent with the altitude and should be ready to get on the route as soon as conditions permit. They are looking forward to their first close up of the mountain which til now has been hidden by the snowy weather. They have had great views of Shivling and in general have had some good afternoons for views after rainy and snowy mornings. After a very demanding trek in they are finally able to begin thinking about the climb itself and we look forward to hearing about some progress in the next few days! Satopanth 2009 - Snowy day in Nandavan, BC tomorrow! Chris calls in on a snowy day to report everyone is feeling well and they hope to reach BC tomorrow! Enjoy a listen! Chris has called in every few days with updates on the trip and the team is doing well and on schedule to arrive in base camp in a few days. The team had planned a rest/acclimitization day in Gangotri at abot 3050m but due to the permit system had to keep on moving! They are making up for this with two nights in Bhujbasa at about 3700m. Everyone is feeling fine on our team though our local agent Arun has had a bad cold and will go back to Gongotri to rest up and the rejoin the team at BC. Our agents often take very personal approach to working with our teams and Arun has been with them every day so far and going much beyond many other agencies. We have the same wonderful connection in Nepal with Nima and the fact that the heads of the companies get to know our members and join them for the early part of the trips is an unusual aspect to our programs. We'll hope Arun kicks his cold quickly and rejoins the team in BC just a day or two behind. More news as the team makes its way to Satopanth! 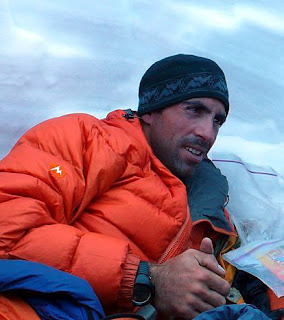 We are truly very pleased to be able to confirm Fabrizio Zangrilli as the K2 2009 expedition manager. There are probably only a handful of people on the planet whom we would be comfortable in having run this trip, and Fabrizio was high on that list for us. We have been very fortunate in getting his not insignificant talents on board. Everest north K2 ( 3 times) including the cesen which he fixed on his own to C4. A couple of years ago, while working on the cesen route, he went from K2 base Camp, 5000m, to camp 4, 7900m, and back to base camp in a day (36 Hours). But he has promised to slow down for this trip..! 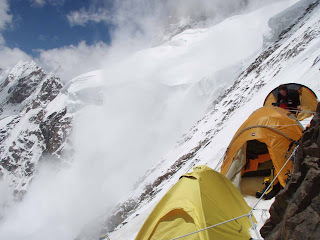 FTA to head to K2 again in 2009! 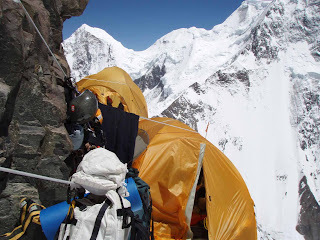 Australian expedition outfitter and Karakoram specialist Field Touring Alpine will be heading back to K2 in 2009 with a 15 person attempt on the SSE spur, or Cesen route. This will be the third serious commercial attempt on the hill after FTA's previous effort in 2006, and Amical Alpin's successful ascent of the mountain via the Abruzzi Ridge in 2004, a year that saw exceptional snow conditions and sunny skies that permitted over 40 summits for the season, a record for the Karakoram giant. FTA's Pakistan manager Dave Hancock said he has chosen the 'Cesen' Line over the Abruzzi after hearing the account of it from best friend Mark Sheen, who climbed up the spur and then descended via the Abruzzi last year with the Norit team. "It seems to me the route presents much better than the Abruzzi if conditions underfoot are good, that's not to say its necessarily any easier, but we are of the opinion that is is significantly objectively safer"
The 4000m long Cesen route, also dubbed the 'Basque Route', follows a spur just on the right side of the south face, which joins up to the Abruzzi at 7800m at the shoulder on K2. It was the way up for the Dutch based Norit team on last years ill-fated expedition. FTA have a double permit that includes Broad Peak, where several of the K2 climbers will go first to aid acclimatisation. "We have teams on G2, Broad and on K2 this season, so interested climbers can mix and match if they want, we've even got one climber doing the Gasherbrum double, and then he plans to head over to K2, we cant say his name but with his resume it wouldn't surprise us if he pulls it off if he can get a couple of good windows. We will have a lot of resources in the Concordia area this season and are hoping for some good weather and successful outcomes"
the grand old days of traditional expeditions with this climb"
FTA have another big season ahead of them in 2009, with all the main Karakoram 8000ers on their to do list, as well as expeditions to Spantik and Trango, and treks accompanying the K2, Broad Peak, and G2 climbers. Dave says there are still opportunities to get on board "We have a few spots left on some of the trips for anybody interested in climbing in the Karakoram this year, we've also got a vacancy for an assistant team manager on one of the 8000m trips if any of your readers have the requisite experience". the gruelling road trip with bikes on the trailer. FTA principal Dave Hancock is off on a one a decade trip to the flooded Australian deserts. Seems a massive hurricane has come through and Dave will be back in a week with more images. "The bikes are Kawasaki KLR 650's - great long distance on/off road tourers,and the bike of choice for a lot of people doing intercontinental runs! We'll do a 700km round trip on dirt to get to Mt Augustus - the whole area is flooded to varying degrees, but we think there is a way thru along some high ground. One major river course, that has been dry for 6 years, is now a staggering 9 metres (20+ft) deep."